Sammy graduated from preschool on Friday. One more summer at Discovery Kids Place, and then it’s off to kindergarten. Can you believe that? View these photos in Flickr. 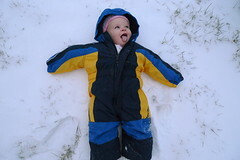 We got our first accumulation of snow in the Washington area yesterday, making it Sasha’s first real snow day. 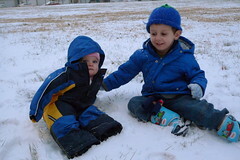 Here are some shots of her and Sammy enjoying the snow. You can get full size versions of these photos from Flickr. This is what snow looks like, Sasha! I can catch snowflakes on my tongue! 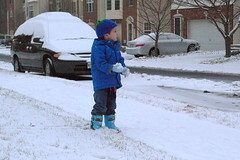 I wonder if I can hit Daddy with this snowball? Sammy’s preschool class had a holiday show before Christmas. Here is the video of his stage debut. And Uncle Boo gave me a suitcase for my Thomas trains. Sammy with his favorite Christmas present, the big dump truck from Santa Claus. I’ll spare the gory details of the entire weekend, only that we’re in the midst of holiday cheer. However, I will relate the story of Sammy vs. Santa Claus. 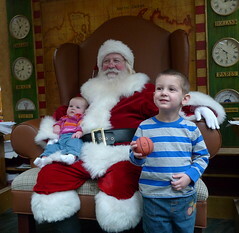 For weeks I’ve been telling Sammy that we need to go see Santa Claus so that he can tell him what he wants for Christmas. We even wrote a letter Sammy could give him detailing his preferences. And finally the day came, Sunday, when we were off to Lakeforest Mall with, I believe, one of the best Santa layouts in Suburban Maryland. Sammy was reasonably good in the long line, as was Sasha who didn’t get fussy until we were approaching. A little nosh (yes, while standing in line) seemed to appease her. As for Sammy, I let him play with my iPhone for a little while, which backfired when it was our turn and I had to yank it out of his hand when he refused to give it back to me. Sasha, who has been plagued with both separation anxiety and stranger anxiety lately, was a perfect angel. She gave Santa her biggest toothless smile and did everything she was supposed to do. Then there was Sammy. I tried placing Sammy on Santa’s lap. His response was to start crying and then hop off. I gave Sammy the letter he had written, which he then threw at Santa and tried to run off. Finally, after coaxing from the photographer and from me, he stood sort of next to Santa clutching a tiny basketball squeaky toy, and then finally sat on my knee as I kneeled down next to Santa. At one point, he gave the photographer one of his “I’m in pain!” smiles. I tried to tell her that that was his smile and that she should get the shot off quickly, but I don’t think she quite believed me. We managed to get off a few passable pictures which we got in prints and on a USB key (a cool l feature that I think is a smart way to go), we were done, much to Sammy’s relief. Sasha doesn't look that happy, but Sammy cooperated for this picture.